Both Chevy and Ford believe they make the toughest, baddest, most durable truck on the market. The question is….who’s right? Chevy rolled out a focus group for an entertaining commercial that highlighted the durability of the Silverado’s roll formed, high strength steel bed vs. Ford’s ‘military grade’ lightweight aluminum bed. If the results speak for themselves, it seems Ford slapped the title “military” on their truck and lost a bit in durability. 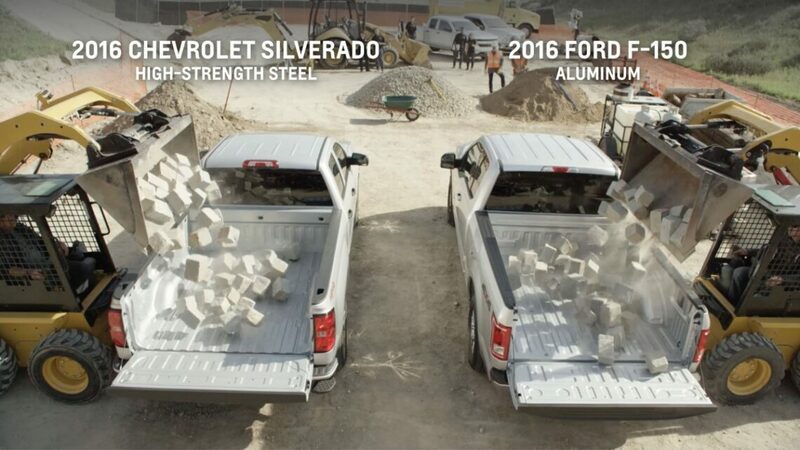 In the piece, Chevy drops 825 pounds of concrete blocks from five feet into the bed of both the Ford F-150 and Chevy Silverado. When the dust cleared (literally) the steel bed featured in the Silverado with scratched and dented. The aluminum bed used in the F-150 was punctured in several places. In the loyal world of pickup truck owners, who would ever want a truck with a weak bed liner? To further the demonstration, Chevy showed the focus group what happens when you push an empty toolbox off the side rail into the bed. In 92% of tests the 28-pound toolbox punctured Ford’s aluminum truck bed. Now could this be avoided by adding a protective bed liner to your F-150? Sure, but it’s worth noting only 17% of F-150’s are sold with a factory bed liner. Even though you don’t even necessarily need it, 50% of Silverados leave dealerships with a dealer or factory installed bed liner. Some Chevy owners are happily just using a sheet of plywood for protection. It’s that simple. 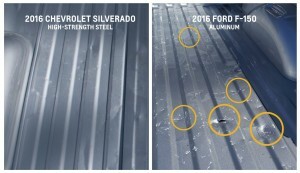 “Although Silverado uses aluminum for the hood and other front-end structures, the bed required high-strength steel because of the abuse it takes from truck owners,” he said. McGrath Auto has over 131 Chevy Silverado’s in stock right now! Come on down and have a member of the McGrath Family show off the high strength steel Silverado truck bed to see it for yourself!